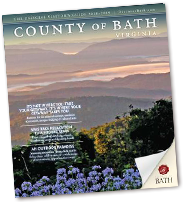 This is where the County of Bath, Virginia shows its versatility against many other Virginia tourism destinations. Not everybody wants the resort vacations; some people prefer a more isolated experience. 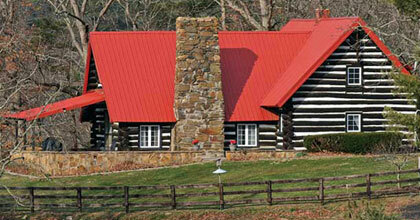 The cottages and cabins in the County of Bath, VA are just the place for that home away from home feel. Fully equipped bathrooms and kitchens ensure that you have all you will need. Enjoy the magnificent views and pastoral setting of Warm Springs Valley with a stay at Alvey Cottage, a well-equipped three bedroom cottage located just 1/2 mile south of Warm Springs. 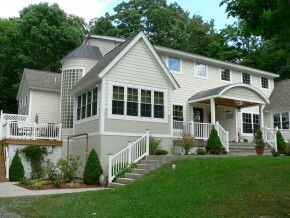 Available for weekend and vacation rentals. Set in a rustic private community elevated above the Village of Warm Springs and next to the world renowned Homestead Preserve, lies the hidden gem of Bath County – Bath Villas at the Meadows. This comfortable private retreat is waiting for you. If you are looking for something more inviting than a typical vacation rental or average hotel stay, you’ll like it here. Bath Villas at the Meadows has everything from luxurious bedding to high-speed internet, fully equipped kitchens and jacuzzi tubs, but the real magic is the setting. Indulge in a true mountain experience by staying at Big Bend Farm, an original log house that was built in 1928 from native lumber and stone. The house features sleeping accommodations for up to eleven people and provides a cozy living area, fully-equipped kitchen and large outdoor decks with a grill. An adjacent cabin can provide sleeping accommodations for two additional people, making Big Bend Farm perfect for large groups or families. Nestled in the mountain surrounding Lake Moomaw in Virginia’s Western Highlands, the lodge and guest houses at Big Like Retreat offer unparalleled outdoor amenities. Enjoy hiking, mountain biking, fishing, watersports, and wildlife at your leisure! Whether you’re looking for a vacation packed with outdoor fun, or a lazy weekend snuggled in the lodge, Big Lick Retreat is your perfect getaway. The lodge and guest houses offer outstanding lake and mountain views and are all equipped with efficient heating, air conditioning, wireless internet and satellite TV. Bring your family and friends–we’ll provide the view, the comforts of home, and the fun! During the summer months we are a successful and highly regarded girls’ camp; the rest of the year we are an ideal getaway with a host of recreational offerings and gracious accommodation found in our private residence, Cabell Cottage. 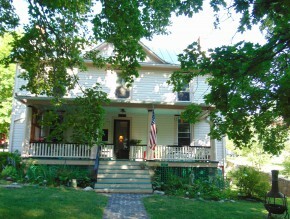 Cabell Cottage can comfortably sleep six or can be the perfect romantic getaway for two. Here you will find three beautifully appointed bedrooms, a full living room with sofa (not a sofa bed) and modern amenities such as cable television, a sound system with iPod docking station and high speed internet allowing you to connect, disconnect or reconnect as you wish. We offer a fully equipped kitchen with modern appliances, dishes, utensils and cookware, as well as a laundry area with full size washer and dryer. For larger groups please inquire about our lodging options. 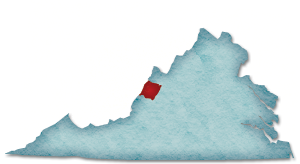 Camp Mont Shenandoah, we are closer than you think and just far enough away to make a difference. Boasting three bedrooms, a fully-equipped kitchen and a spacious balcony, the Coffee Pot Lodge is an ideal home away from home. 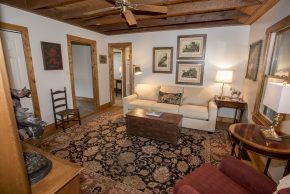 Cordwood Cottage is conveniently located between Hot Springs and Warm Springs and is a 5 minute drive away from The Omni Homestead Resort and a 4 minute drive away from The Jefferson Pools. 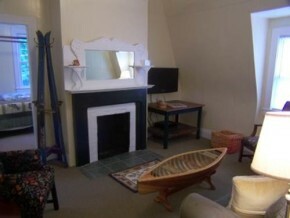 Guests love staying in this 2 bedroom, 2 bath cottage which includes a living room, dining room, a fully equipped kitchen, washer and dryer and an outside deck. 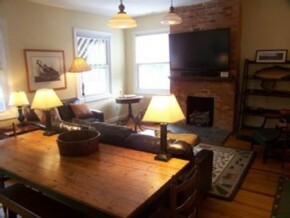 This very charming and cozy cottage is furnished with personal antiques and artwork. Wifi is available. This property is available for both short term or long term rental. 2 Bedroom, 1 Bath, Sleeps 6. This apartment is conveniently located in the center of Hot Springs within walking distance to the resort hotel, The Omni Homestead. There are shops and restaurants: wine, coffee, Subway, Sam Snead’s Tavern and other amenities next door. Non smoking only, children welcome, pets considered, wheelchair inaccessible. Tucked in an untouched valley, Fort Lewis Lodge & Farm is an intimate country hideaway set on a 3,365-acre estate in the mountains of Virginia. Our twenty-one distinctive accommodations offer a rare mix of unpretentious elegance and unique architecture where every room has a view. Three “in the round” silo bedrooms, four hand-hewn log cabins with stone fireplaces, our rustic lodge and 2 private homes are perfect for a true country getaway. Evenings are highlighted by seasonal cuisine served in the historic Lewis Gristmill followed by a fire in our timber-framed pavilion. This is destination dining, where the emphasis falls firmly on the cuisine and the kitchen never ceases to impress. Outdoor activities abound with miles of hiking trails, biking, fly-fishing, canoeing, birding or simply relaxing by the pristine swimming hole. Family owned and operated for over 30 years, Fort Lewis is also a working farm, where fresh produce is grown on property, chickens and pigs are raised, and the pastureland is used for a grass-fed cattle herd. For the purist, mountain spring water flows fresh from our taps and the unspoiled forest, fields and streams are ready to be explored. Dinner and breakfast are included with your stay. Newly renovated and beautifully furnished. Grandview Cottage has 1 loft style bedroom, 1 bath, living room and cable TV, kitchen, washer/dryer, and front and back decks. The Cottage sleeps 4 people and the couch in the living room pulls out to a second king bed. 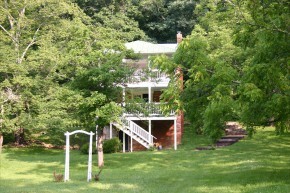 Guests have access to the entire private cottage and separate driveway. Located in the charming village of Bacova, Hemlock Cottage is conveniently close to all of the shops, restaurants and other attractions in Warm Springs and Hot Springs. This cottage comfortably sleeps seven adults and two children, making it the perfect retreat for several couples or families. 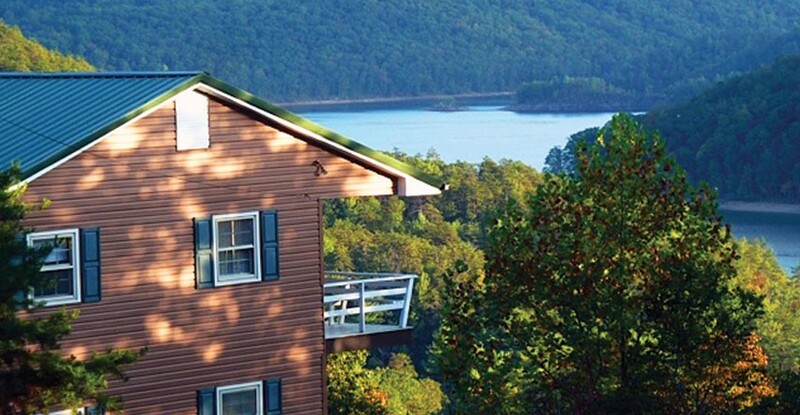 Just a short drive to the world famous Homestead Resort, Douthat State Park, Lake Moomaw, Gathright Dam and the George Washington National Forest, the Hemlock Guest House offers many activities including swimming, fishing, boating, hiking, cycling or picnicking. 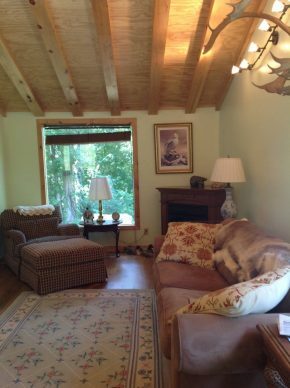 In addition, all three lodges have plenty of “quiet time” spaces for your relaxation if you want to kick back and rest, read a book or watch the deer in the woods nearby. 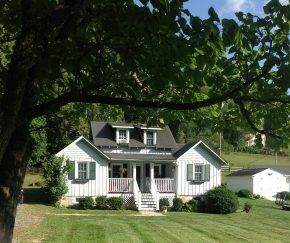 Holly House is in a charming setting in the village of Bacova, Virginia. Bacova was built in the 1920’s as a lumber mill town and the entire village was completely restored in 1965. Holly House is representative of a company house that has been recently renovated (2016). The house offers ideal vacation living with an open floor plan on the first level. It has a spacious deck with a grill and a screened porch off the living room. It will comfortably sleep 8 adults and. There are 4 bedrooms and 4 baths. Two bedrooms have a private bathroom. The other two bedrooms share a bathroom. In addition, there is a bathroom in the basement. The Bacova location is convenient to shopping and restaurants in nearby Warm Springs and Hot Springs, mineral baths in Warm Springs, 10 minutes from the fabulous Omni Homestead Resort in Hot Springs, and only 5 minutes from Lake Moomaw. 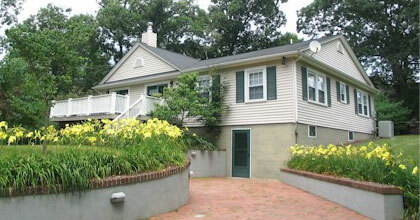 The property is next door to Hemlock Cottage another one of Bacova Properties’ vacation rentals. The two can be combined for large outings and family reunions. 2 Bedroom, 1 Bath, Sleeps 8. This apartment is conveniently located in the center of Hot Springs within walking distance to the resort hotel, The Omni Homestead. There are shops and restaurants: wine, coffee, Subway, Sam Snead’s Tavern and other amenities next door. Non smoking only, children welcome, pets considered, wheelchair inaccessible. The Meadow Villas at Warm Springs are beautifully appointed and fully furnished villas that offer one, two and three bedroom units, full kitchens, private decks, laundry facilities and a few units with a sunroom and gas fireplaces. Available for rental daily, weekly or even long term. Ask about our owners’ special packages. 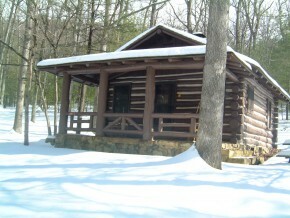 Mountain Cabin is perfect for the outdoorsman looking for a peaceful spot off the beaten trail. Whether your passion is hiking, mountain biking, horseback riding, hunting, fishing, or relaxing on the front porch, we’ve got you covered! Nestled against Back Creek Mountain, Mountain Cabin sleeps up to 7 and is situated on 2 open acres, surrounded by forest, and bordering George Washington National Forest. Hiking, biking and equestrian trails are everywhere throughout beautiful Bath County, with Bogan Run trail only 1 mile from the cabin, and many others just a short car or trailer ride away. Great fishing is available in nearby stocked trout streams, as well as Dominion Back Creek Recreational Area, (5 miles up Rt. 600), and Lake Moomaw, (13 miles). Both also offer areas for swimming and boating. 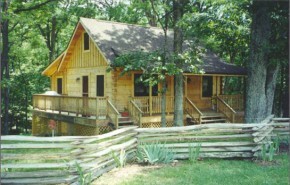 Entire cabin, with full kitchen, washer/dryer, bedding and towels provided. 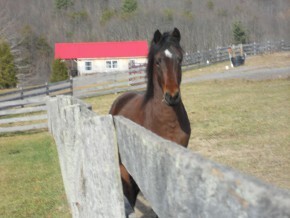 Open panel horse stalls are available for trail riders, and a dog kennel will be available soon! WiFi is available at the cabin, which will allow you to use your cell phone, or call from the phone available in the cabin. There is no cellular phone coverage in this area. TV is available for DVDs only. Call or text David with any questions at (540) 290-3465. Natural Retreats is an International hospitality company offering vacations at luxurious residences and lodges surrounded by the breathtaking natural beauty that is Bath County. These unique properties offer floor plans ranging from two to five bedrooms and can accommodate families of every size. Our trademark “Concierge Service” provides you with advice, access to attractions and activities and we can help you plan every detail of your holiday, helping to ensure that every day of your vacation is unforgettable. 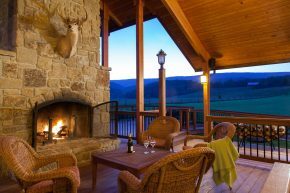 A One of a Kind Get Away for experiencing the Highlands and the Cowpasture River. 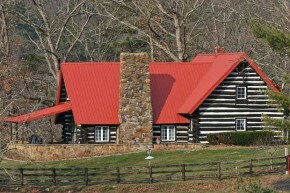 The Cabin at Sycamore Bend looks out over fields, woodlands, mountains and the river. 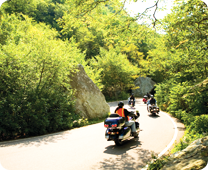 We hope you will enjoy the complete solitude, the adjacent National Forest, and the villages of Bath County. 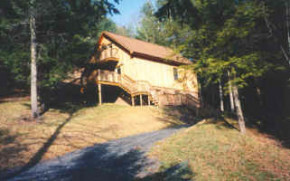 You can enjoy hiking, mountain biking, fishing, kayaking, tubing, swimming, and hours of relaxing porch-sitting in a unique place right here on the farm. 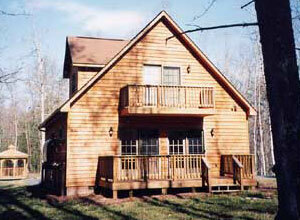 The cabin comfortably sleeps 6 adults, and has a fully equipped kitchen. While located in a private residence, this property has a history of housing area visitors when they came to golf, ski, take to the waters, or as ‘lowlanders’ trying to escape the heat of the city. We offer two second floor bedrooms; clean and comfortable, with a shared hall bath. This is country living; there are no televisions or air conditioners; cool breezes cool in the summer and in the winter months the rooms are heated by an outside wood furnace. Smoking is not allowed on the premises. Though zoning for our area prohibits meal service, there are local restaurants close by with good food and reasonable pricing. Reservations can be made via the Airbnb site, email or phone. Please contact us for availability. For a family or group of friends looking for a more private mountain escape, The Bend House is the ideal retreat. 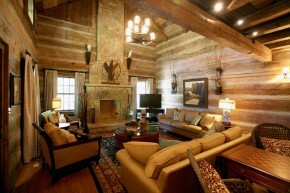 The residence sits on a premier 165-acre tract and provides all of the comforts of your very own home away from home. 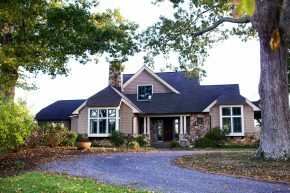 Featuring 360-degree mountain views, private access to the Cowpasture River, and custom-built accommodations, guests will be able to relax fully into the country living experience. The estate boasts a main house and guest house. 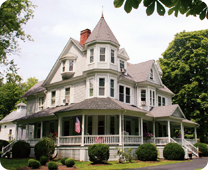 The main house’s four cozy guestrooms are upscale and feature individual bathrooms, while the guesthouse offers additional lodging to accommodate larger groups. 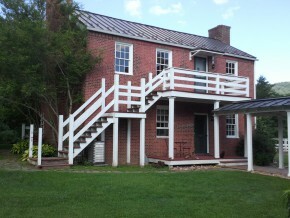 The Tannery was built circa 1820 on old Germantown Road, a historic central byway, which in its heyday was an important part of revolutionary Virginia and used for the exploration of the western frontier. Constructed with handmade brick and heart pine beams, the Tannery was initially a blacksmith shop, a tannery and relay station for riders to obtain fresh horses. 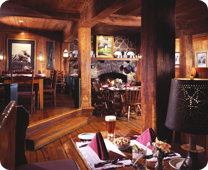 In 1997, the Tannery was updated, remodeled and furnished with antiques. 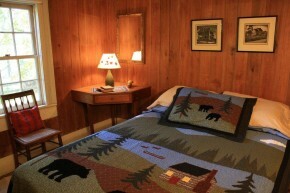 There are two bedrooms with queen size beds and a sleeping porch with a pair of twin wrought iron beds. 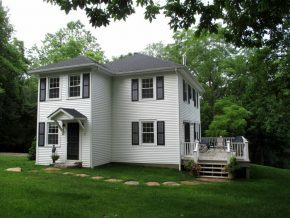 Large double back porches overlook two streams and a lovely treed half-acre. The Warm Springs Stream flows through the rear of the property with warm mineral water around 90 degrees. There is a small pool and waterfall for a unique soaking experience day or night. To the front and side of the house, a cold artisan spring supplies The Tannery with the purest water and then trickles through watercress to meet the Warm Springs stream. Within walking distance of the Warm Springs Village. 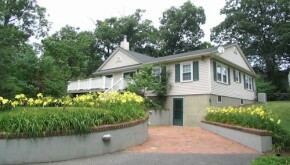 Amenities: Fireplace, local phone, VCR & tapes, stereo, full kitchen, microwave, refrigerator, cooking utensils provided. One AC window unit, fans, linens, laundry facility and maid service. One and one-half baths. 2 night minimum stay required. Well behaved and groomed dogs allowed for an additional fee. The Tuck-Away Cabins are just that—two secluded log cabins in the rustic backwoods of Millboro. But don’t let their remote location deter you. 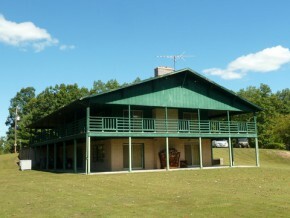 These beautifully decorated cabins offer all of the amenities of home and come with a large yard. 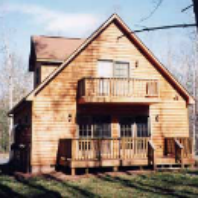 Whether you’re looking to take a relaxing vacation by yourself, or with the whole family, the Tuck-Away cabins are a nice option for a weekend or week long retreat. Turtle Brook Farm is set up not only for trail riders, but its accommodations are equally suitable for hikers, bird watchers, fishermen, mountain bikers or anyone else looking to get away to the heart of Warm Springs unspoiled mountain splendor. Each of the two, one-bedroom cabins can comfortably accommodate a family of four or two couples. Each has a fully-equipped kitchen, grilling facilities, pleasant living areas, porches and decks to take in wonderful farm views. Horse facilities include two 12×24 covered shelters with secure paddocks, a working ring, pasturage and trail access to thousands of acres of U.S. Forest land over Cobbler Mountain into Hidden Valley.